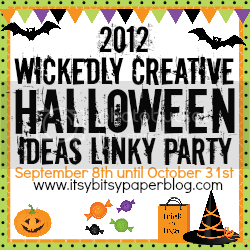 Did you check out all the crafty craziness that was going on here last week for "Wicked Craft Week?" If not just remember Santa's watching you. 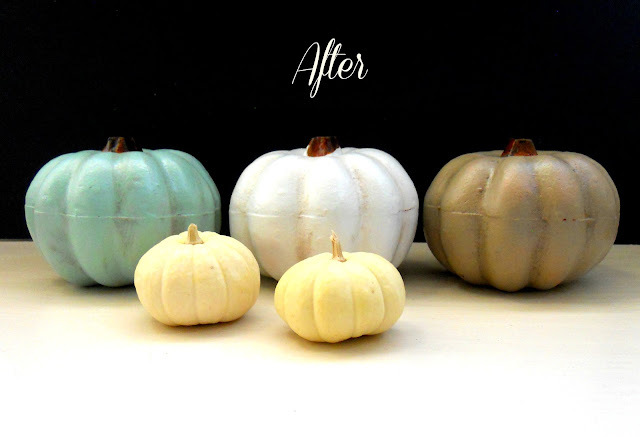 For the rest of ya, do you remember Lindy of Itsy Bisty Paper's fab Dollar Store pumpkin makeover? Pretty swell, huh? One of my favorite things about crafty blog land (not to be confused with Rainbow Land) is the fact that you can give twenty peeps the same object and in the end there will be twenty different things you can do creatively with that object. 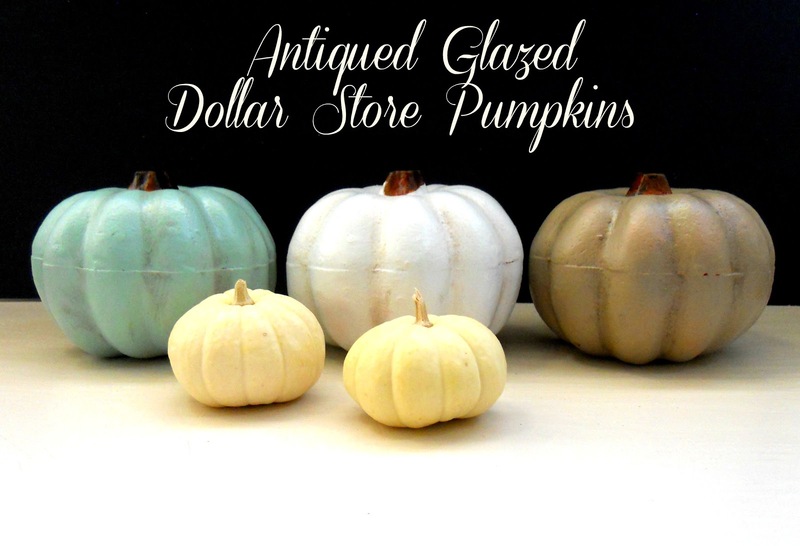 Case in point.....the Dollar Store pumpkins. There are a ton of tutorials out there on all the nifty things you can do with these bad boys. Seriously, there are like five hundred and seventy five things to do with them and now I'm about to share number five hundred and seventy six. I happen to grab a few from my local store a couple weeks ago thinking I would use them in my front porch decor but after I got them home I decided I wanted to spruce them up with some spray paint and incorporate them in my living room instead. To spice things up a bit I decided to spray paint them three different colors; Krylon's Catalina Mist (of course! I seriously should be a spokesperson for this color!) Krylon's Dove White, and Urban Beige by Valspar. I just simply covered the pumpkin's stems with painter's tape and then went to town with my spray paint; inhaled fumes and all. Then I let them dry for about an hour. To my suprise the paint worked well on the styrofoam material but I felt like they needed a little something-something. 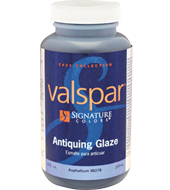 Enter antiquing glaze. That's it! Another way to makeover over a Dollar Store pumpkin. 2013's Wicked Craft Week is going on now. Come check out these easy and spooky 'eye' scream treats! Gosh!! That looks fantastico! And yes, you are the queen of awesome colors. That's for sure! Love that color combo. So pretty! I love the pastel colors!! Super girly and Shabby Chic! So cute -- and so well done! I love the colors. I love these, seriously so cute! love the colors you chose too! 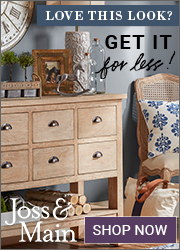 you are so creative jennifer and helping us keep our projects cheap is a bonus! These look fantastic. 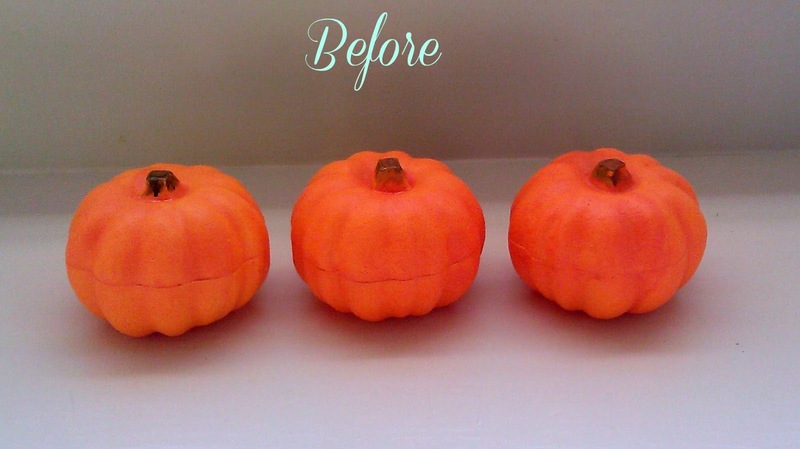 Just love all the things you can do with those ugly orange pumpkins. You would never guess that we used the same pumpkins for our transformations when you see the after pictures. I love how versatile they are. I'm for sure wanting to go get some more now that I have seen yours. 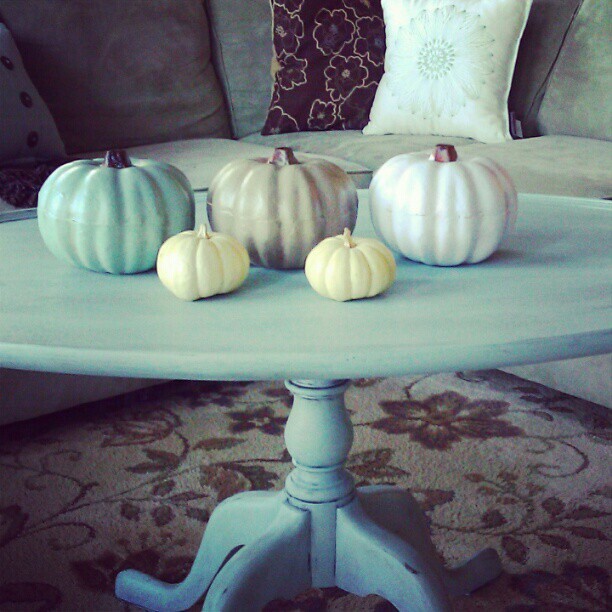 A great idea for a Thanksgiving centerpiece. These are darling! 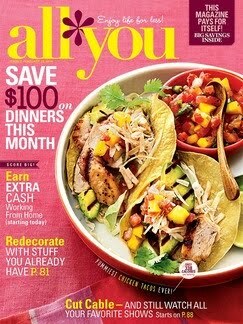 I'd love for you to come link them up at my weekly Tuesday Time Out Party ! I found you via your awesome cracker post at Itsy Bitsy Paper! These are so gorgeous!! I think you already know I share your love of blue...that one is definitely my fave!! So chic, I would want to keep them up all year round! You are very clever....This would be a great project with my kiddies. Thank you. They are so, so cute! I think I am the only one who hasn't purchased any of those dollar store pumpkins yet. I was planning to go there today but ran out of time. VERY cute and chic:) Thanks for coming to party with us at Whimsy Wednesday! I love the colors that you did! so much cuter than orange! So sweet! Love the colors you chose.